UPDATE | Sky Sports has won the exclusive live rights to show competitive England matches in the brand new UEFA Nations League. Meanwhile ITV will show exclusive live, free to air coverage of all England’s qualifying matches for major tournaments until 2022, under a new deal announced today. 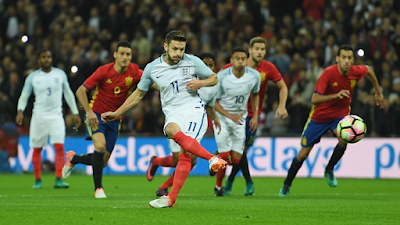 Over on ITV, as well as retaining live and highlights rights to show all qualifying ties for the UEFA Euro 2020 and the 2022 FIFA World Cup, the broadcaster will exclusively show England’s pre-tournament warm-up matches in the event of qualification to each competition. Sky Sports has won exclusive live rights to all Home Nations for the inaugural staging of the UEFA Nations League, which will be split into four leagues based on UEFA rankings with the best teams playing the best teams across September, October and November 2018. The four group winners will enter the knockout final four in June 2019, with semi-finals and final to determine the UEFA Nations League champion. The Nations League will determine the seedings for the qualifiers for UEFA Euro 2020 and FIFA World Cup 2022.